Both newspapers and television bulletins have covered the work of the Royal Air Force in responding to the devastation caused by Cyclone Idai. The Mail on Sunday and the Sun on Sunday both report that Defence Secretary Gavin Williamson has confirmed an RAF aircraft will deliver aid to the stricken country. The capability and expertise of the RAF is crucial in circumstances such as this, when many villages, access routes and landmarks have been submerged by floodwater, making land-based rescue missions incredibly difficult. The UK stands united with those affected by the devastation of Cyclone Idai at this incredibly difficult time. Our partners across the globe can count on our Armed Forces to lend a helping hand in times of need, which is why we are sending an RAF aircraft to assist with the aid relief. The Sunday Express notes that the flight could deliver solar lanterns, water purifiers and shelter kits to ensure survivors have their basic needs met in these desperate circumstances. BBC Breakfast also included information on the RAF's work in its report on the cyclone this morning. The RAF's A400M Atlas aircraft will help provide relief to the 37,500 people currently estimated to be in need of shelter. It is capable of delivering up to 20 tonnes of UK aid to Mozambique in support of the Department for International Development. 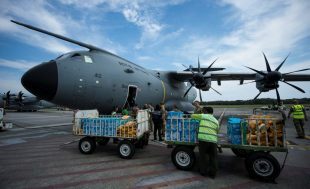 This RAF A400M Atlas aircraft delivered UK aid relief to those affected by the earthquake and tsunami in Indonesia last year.